School achievement at the elementary and secondary level is crucial for children's future success in higher education and the workplace. All children deserve an education that provides them with the knowledge and skills they need to succeed. The No Child Left Behind (NCLB) Act of 2001, a federally mandated education policy signed into law by President Bush, has filtered through our educational system with the promise of preparing disadvantaged students for academic achievement and countering educational inequities. NCLB requires that all states establish a timeline to ensure Adequate Yearly Progress (AYP) toward the goal that 100% of students overall and in all designated subgroups are proficient in language arts and math by 2014. If a school or school district has at least forty students in a particular subgroup (White, Black, Hispanic, Asian, Native American, Multiracial, Limited English Proficiency, Individualized Education Program, or Low Income), it is accountable for the progress of students in that subgroup toward 100% proficiency. 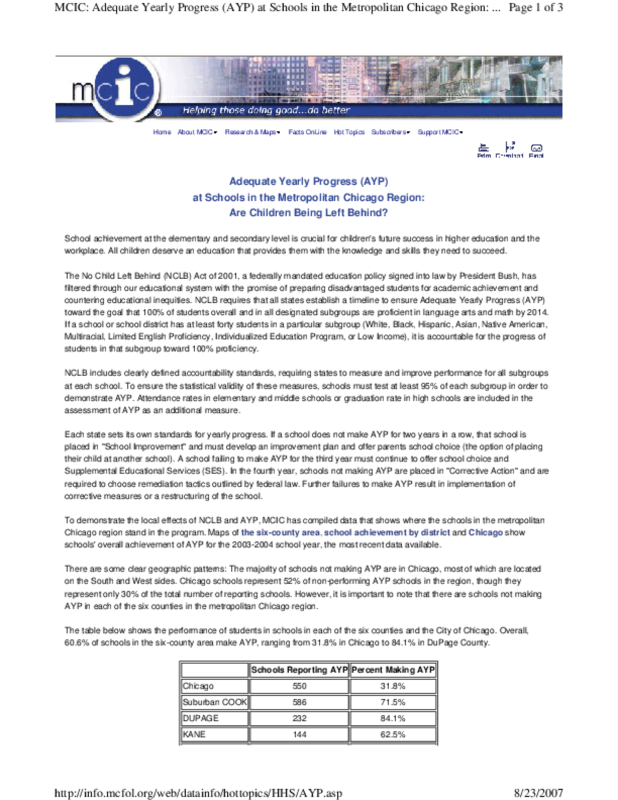 To demonstrate the local effects of NCLB and AYP, MCIC has compiled data that shows where the schools in the metropolitan Chicago region stand in the program. Maps of the six-county area, school achievement by district and Chicago show schools' overall achievement of AYP for the 2003-2004 school year, the most recent data available. There are some clear geographic patterns: The majority of schools not making AYP are in Chicago, most of which are located on the South and West sides. Chicago schools represent 52% of non-performing AYP schools in the region, though they represent only 30% of the total number of reporting schools. However, it is important to note that there are schools not making AYP in each of the six counties in the metropolitan Chicago region. Copyright 2005 MCIC (Metro Chicago Information Center). All rights reserved. Title: Adequate Yearly Progress (AYP) at Schools in the Metropolitan Chicago Region: Are Children Being Left Behind?